It’s convention season, we think its the perfect time for a guide for conventions and exhibitions. First off this is a guide based on our own experiences having visited numerous conventions and exhibitions around the world. Most have different rules and regulations, as well as each vendor/booth, have different sales techniques. 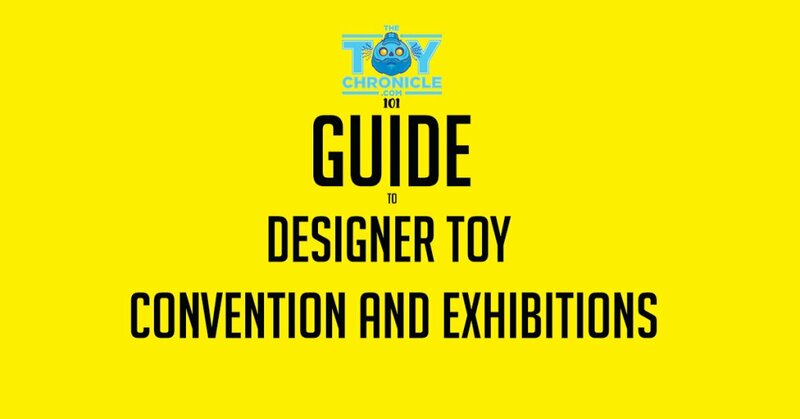 For us, meeting artists and seeing what’s on offer and what’s been showcased is one of the highlights Designer Toy Convention and Exhibitions. Here’s a guide for collectors new/old to Designer Toy Convention and Exhibitions. Check the layout of the event and where their booth will be at so you can navigate and won’t be running around like a headless chicken trying to find them. Usually, artists /vendors showcase what they will have at their booth a week or even a day before. Make sure you mark down what you are after. If you are looking to buy exclusives jot down which ones are your priority, this way you will know which booth to go to first and less chance of missing out on the item you want. Get there early, if you are looking to buy exclusive and/or limited edition items. Some conventions offer VIP tickets so you can gain access early. Some VIP tickets offer you a bonus which included extra goodies too. Food! Some have food stalls some don’t. Explore what good around the area. Be polite and ask if you can touch something before picking it up, especially if it’s a hand-painted or sculpted piece. Don’t forget to check your favourite artist releases, some exclusives might be released on a specific day. Don’t be afraid to chat to people running the booths. We really enjoyed chatting with people over the years, not everyone will put a face to a name they have seen on the internet so don’t be taken back by it. Most artists will do a sketch for you, however, it’s better to ask for them after the peak rush in the morning. Especially if you expect if for free. Don’t feel that anyone is unapproachable. They’re normal people. Usually. In our experience cash is king but a few artists now offer wireless transactions which seems to go down well not having to carry so much cash around. We found in China and a few other Asia exhibitions WeChat and other forms of wireless transactions out weight cash but in general, cash is the easiest way to pay. INSTINCTOY for example, now as an online lotto entry for some of the exclusive releases and then if you win you would be entitled to pick it up at the convention. Please note this is just an example and a smaller release sometimes don’t use the lotto system. More and more exhibitors have product cards so collectors can point at what they want so you don’t have to worry about any language barrier. Meet up fellow collectors, another highlight is meeting people with the same passion. Maybe a trade-off? Perfect time to meet people who you’ve spoken to on the internet. Portable charges for phones/extra charged batteries for cameras etc is a good thing to carry around as well as some side snacks and water if you like, because honestly… I always walked till I’m hungry but then to walk all the way to somewhere else to get a drink/bite is such a bother. Spend time at every booth, even if you don’t know the exhibitor, you might find a new love or something you didn’t think you would fall in love with. Releases! Now, this gets more complicated and sometimes confusing. Some may be strictly limited and some vendors choose to have a first come first served release. Some will be timed release. In Asia more artists and vendors are using lotto system so please check the sales details. Take your time to look around, always hidden gems. It’ll be quieter in the afternoon, so will give you more of a chance to wander around again to see if you have missed anything. Take your chance to see everything in hand, much better than photos and videos. Some conversations aren’t just about buying and meeting artists. Some hold question and answers sessions, prepare some questions you would like to ask. Bring a notepad & pen – you might learn a few things from artist/customizers sharing their tips and guides. On the certain vendors there are flyers/business cards – pick them up, sometimes there are discount codes for future purchases! Check if it’s ok to handle products on booths before picking things up. Some people are fine with it, others aren’t so keen. For exhibitors, we called upon Jon-Paul Kaiser aka JPK to give exhibitors a few tips seen as he’s travelled the world exhibiting solo or as a part of a collective. Prepare well, display well, have good light etc Make sure you have plenty of stock and take along an inventory of what you have. If you can, take someone to assist you. They can box up a purchase and answer queries from people, freeing you up to talk with potential customers and contacts. It’s also great to have some company. I have a few golden rules I try my hardest to follow at conventions;- Always stand up. It keeps your energy up and makes you look engaged and more approachable Keep your phone away. Don’t check it at all if possible. It sends out the wrong signal, distracts you, can put off potential customers or people who want a chat. Engage with people, chat etc but never put on a hard sell. If people want to buy something, they will. A hard sell style can put off someone who was determined to buy. Smile and be as genuine as possible. Have your boxes opened and within easy reach, that way when people buy you’re spending the minimum of time away from them and talking to people. Never be dismissive of anyone; even if they have no intention of buying anything, a positive experience may edge them into a creative career, or put them in a good enough mood to buy from someone else. We hope the guide was a little help to you all and took something from it. Enjoy your designer toy adventure conventions and exhibitions are waiting for you. Feel like we’ve missed anything out or have any other cool tips? Comment in the comment section below and we will add it in. Special thank you to Maddie Madwolfie and Jon-Paul Kaiser for the input. This elaborate list will be very helpful in the future and I am looking forward to see you around at a Toy Convention for a little chat among the freaks.